It’s an exciting pre-Oscar Caturday with award show season in full swing. The Oscars are on Sunday but we have the 2016 Cat Oscars. Our cats enjoy watching the Oscars and while there are certainly some human actors worthy of purr-aise, I think it’s about time we acknowledge those creatures who know the best way to work a red carpet… is to roll on it, shed on it, strut their Oscar-worthy furs on it, tails up all the way! I recently partnered with MeowMix cat food to recognize the year’s top four-legged performances in the 2016 Cat’s Meow Awards That’s right – this year’s most anticipated awards show honors a golden flurry of furry faces. Meow Mix brand received more than 25,000 submissions from all over the country for the 2016 Cat’s Meow Awards which was established to celebrate the best cat moments of the year and the one-of-a-kind bond that only cats and humans share. 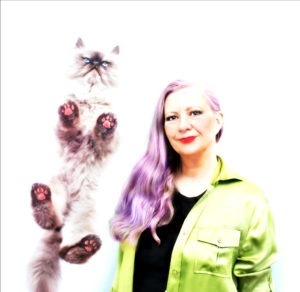 Con-cat-ulations to the all of the 2016 Cat’s Meow Awards finalists and winners! But let’s face it, cats couldn’t care less about glory or fame… that’s why Meow Mix brand created a new line of Irresistibles treats so that you can give them the award they’re really looking for. With real meat, a wide variety of flavors, and both soft and crunchy textures, your cat will be sure to thank you in her acceptance speech. Go to IrresistibleMoments and share your cat’s irresistible moment to get a FREE bag and see tons of other cool cat content. If you didn’t get enough doggie photos from our Westminster Dog Show post, I guest blogged at Sugar The Golden. It’s a more educational style post with pics not posted here. Learn some amazing things about dogs! Is your cat a quirky Aquarius? Find out at our cat astrology column. 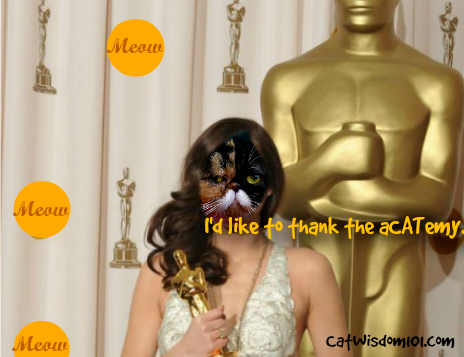 Do you have a 2016 Cat Oscars worthy cat? Which movie star do think your cat(s) resemble? Congratulations to the winners! We especially loved the nappers video. Concats to all those great winners. Concats to the winners! These are a lot more fun to watch instead of those boring human awards. ConCats to da winners and nominees. We think we shulda been there fur bestest cuddlers and luvvers. MOL have a gweat weekend. Do you watch the Oscars in Switzerland? What a great “batch” of winners! Cats are so cool – whether awake or asleep, happy or sad, young or old – WE JUST PLAIN ROCK! Congrats to all winners! Wow, meow wow. Concatulations to all! Mao and Ched loved these. I loved alllllll of them. Mao resembles …Johnny Depp. Aye, Mao’s a pirate…Not that Mao steals, (he doesn’t) but he’s a clever devil, aye, he is, he is. Mao and Ched need their own blog! Concats to All!!! We know that their are no losers in the cat world! My crew loves the treats both dy and soft! We will go to the site and look at all of the furtastic vids! Thank you for sharing this great stuff! Yes, all cats are winners! Those are always so much fun! Great video clips! I love What’s up? clip. So cute! Glad it brought a Caturday smile! I didn’t even know about this until the awards were being announced.